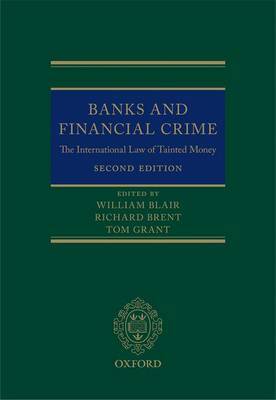 This thoroughly revised and updated new edition provides a practical guide for banks and their lawyers in respect of their regulatory responsibilities, their private law duties, their liabilities to third parties, and their obligations to assist persons seeking the recovery of assets (including regulatory bodies within and without the jurisdiction) as they relate to "tainted money". It also sets the law in its national and international policy context and pays particular attention to the international sources of the relevant law. It draws on the expertise of civil and criminal practitioners, public international lawyers, and overseas (in particular US) lawyers. The second edition addresses recent practice under the main international conventions, including the Sixth Session of the Conference of the Parties to the UN Convention against Transnational Organized Crime (October 2012) and the Fifth Session of the Conference of States Parties to the UN Convention against Corruption (November 2013). UN Security Council Resolutions, in particular resolution 1904 of 17 December 2009 which established the delisting ombudsperson (in response to criticism by national courts), have been considered.The book considers the work of international bodies such as the Financial Action Task Force and new primary legislation at domestic and European level, including the Fourth Money Laundering Directive. Additionally, decisions of the European Court of Human Rights, the Court of Justice of the European Union and national courts are analysed and explained. It also provides a further assessment of the extent to which there has emerged an international law of tainted money to complement the emergence of an international financial system. In a concluding chapter, it gives an overview of the emerging response of courts and regulators (national, EU, and international) to the challenges presented by new technologies such as Bitcoin and other virtual currencies.